1.3 How to Check AP ECET Exam Results 2019? AP ECET 2019 Results will release by the Officials of APSCHE on 29th April. Check AP ECET Exam Results 2019 @ sche.ap.gov.in/ecet, the official website. Candidates who take the Andhra Pradesh ECET Exam on 19th April 2019 can get the direct link to check the AP ECET Results 2019 on this page. Conducting Board Jawaharlal Nehru Technological University, Anantapur. AP ECET 2019 Exam Date 19th April 2019. 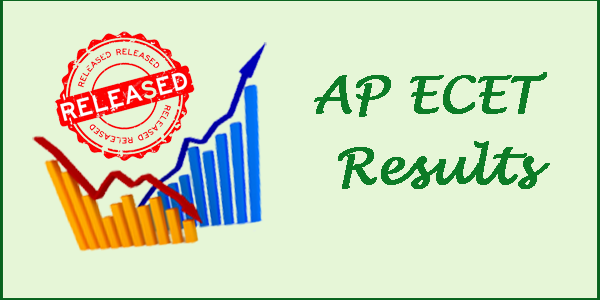 AP ECET 2019 Results Date 29th April 2019. ఆంధ్రప్రదేశ్ SCHE ఎ.పి ఇసెట్ 2019 ఫలితాలు విడుదల చేస్తుంది. అభ్యర్థులు మీ ఎ.పి ఇసెట్ 2019 ఫలితాలు పొందడానికి క్రింది లింక్పై క్లిక్ చేయవచ్చు. How to Check AP ECET Exam Results 2019? At the Time of ECET results announcement, the official server is too busy. So, the candidates can check the ECET Results 2019 from this page. Also, you can check the ECET Results 2019 AP from the official portal by following the below steps. Go to the AP ECET official website by click on the link provided below. The AP ECET Results 2019 link will appear on the screen. Click on the link to enter into the results login page. Enter the details in the specified fields without any mistakes. Your ECET Results 2019 AP will appear on the screen. View the results and take a copy for future reference. Save the Andhra Pradesh ECET Results Copy until the end of the admission process. Candidates can download the AP ECET Rank Card from the official website after the declaration of results. The ECET 2019 AP Rank Card is a mandatory document to the individuals who are going to participate in the counselling process. We update the Andhra Pradesh ECET Exam Rank Card Download link on this page as per the officials. Soon, the officials of APSCHE will declare the ECET Counselling Schedule. So, the candidates those who got qualified in the ECET Exam can check the https://sche.ap.gov.in/ECET/, the official website for latest updates.